When Jael’s brutal seraph army trespasses into the human world, the unthinkable becomes essential, and Karou and Akiva must ally their enemy armies against the threat. It is a twisted version of their long-ago dream, and they begin to hope that it might forge a way forward for their people. And, perhaps, for themselves. Toward a new way of living, and maybe even love. But there are bigger threats than Jael in the offing. A vicious queen is hunting Akiva, and, in the skies of Eretz … something is happening. Massive stains are spreading like bruises from horizon to horizon; the great winged stormhunters are gathering as if summoned, ceaselessly circling, and a deep sense of wrong pervades the world. What power can bruise the sky? I’ve spent more than an average amount on the Daugter of Smoke and Bone trilogy, as I’ve already translated the first two parts to Slovenian (see my Translations page) and I’m currently working on Dreams of Gods and Monsters. This trilogy was the largest commission I’ve received from my publisher and I’ve enjoyed it immensely. Dreams is huge (it clocks in at more than 600 pages) and more difficult than Daughter and Days, but I loved having the opportunity to follow the characters’ (and the author’s) evolution through roughly 1500 pages. This is how I feel the story progresses – and I’m not saying there’s anything wrong with it, it’s just that the plot in Dreams is quite … wide. In case it’s unclear, the different colours represent different storylines. The first two parts are relatively linear in their matter (though by no means boring, never that! ), but the third part encompasses a truly epic array of plots, subplots and sub-subplots, almost to the detriment of the story. As for the characters … I have to admit that as much as I love Karou and Akiva, it’s Zuzana and Mik (and others!!) who really made this last part so brilliant. Akiva might be the drop-dead-gorgeous, fire-eyed, soul-deep-loving hero, but if I had to choose, I’d go for Mik or Ziri any time. Akiva is just so INTENSE I feel like it would take a constant effort to be around him. Me, I’m the cuddle and relax type of person. I loved Zuzana’s snark and eyebrow action, I loved the slow and shy courting, I loved the gentle path of forgiveness that Akiva and Karou set out on. Laini Taylor is the master of heart-squeezing, warm moments that made me go all squeaky and soft and I hurried through the scenes to see if she finally, FINALLY made some decisions I really hoped she’d make (she did, she did!). I’m sorry if I’m not making enough sense, I just want to avoid spoilers because you really don’t want to know about this before you read it in the book. But Dreams of Gods and Monsters is also serious, deadly serious about some things. One of the best quotes, I think, is dead-on true: “‘We have so many enemies, Lisseth,’ said Karou, keeping her voice light. ‘Most of them are our birth-right, inherited like duty, but the ones we make for ourselves are special. We should choose them with care. '” Dreams is also about accepting responsibility, about actions that have far-reaching consequences even when you didn’t mean it. It’s about settling the score and putting things to right. It’s about putting others first. And it’s about the knowledge that happy endings come about (and last!) only if you work for them. And it’s perfect. 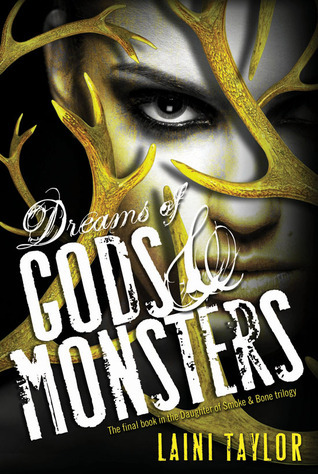 Have you read Dreams of Gods and Monsters? Or maybe just the first book or two? This entry was posted in Book Review and tagged 5/5, fantasy, review, series, YA on June 2, 2014 by Kaja. Hahaha YES! That graph accurately represents this book! Yet somehow it works! It does, doesn’t it? :) I can’t wait to see what she writes next.